Benny and Mr. Deep. More about Benny later. Mr. Deep and I visited Vilankulos Mozambique recently. In addition to the details of the trip that I shared in this post we had several other fun (and funny) adventures. First, the currency situation. Mozambique uses the metical. The hotel was unable to exchange more than a little bit of money for us. 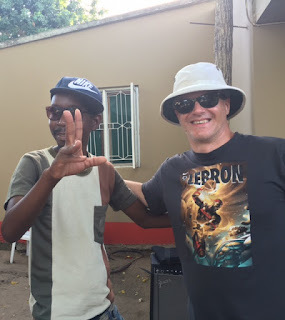 But word quickly got out and soon various hotel staff were approaching "the white guy with dollars and rands who is looking for meticals" and were offering to exchange money for Mr. Deep. It seems many of the staff were excited to get their hands on some South African rands. The whole exchange process became pretty informal as Mr. Deep and various members of the staff negotiated exchange rates. Next, the hotel. The Dona Ana has a pretty art deco style and unbeatable views of the ocean. The hotel staff were all very kind and helpful but many things were funny. Need a towel for the pool? Ask and then wait 15 minutes for someone to bring one. Need a fork to eat your breakfast? Just grab one off another table. Also, a funny thing about the hotel was the choice of music that was playing in the bar and by the pool throughout our stay on a repeating soundtrack. The song that stands out the most that we kept hearing over and over was "Tell Laura I love her." I don't mind searching for a fork when I am enjoying this view. The hotel wasn't the only establishment we visited which operated at a slow and less than efficient pace. We went to a really fun beach bar called the Casbah which couldn't have been more cool or in a more beautiful location. But, if you ever visit Vilankulos and go to the Casbah be aware that you should order your food about two hours before you get hungry. If you do this everything will be timed just right and you will get your food right when you are ready to eat and before you get too drunk. I also nominate The Casbah to be featured on a TV show that Mr. Deep and I used to like to watch back in the USA called Bar Rescue. Bar Rescue stars a bar business expert named John Taffer as he visits various bars and tries his best to whip them into shape in a short time. It's like the show with Gordon Ramsey only about bars. John Taffer should visit this place as the whole time we were sitting there having drinks and waiting patiently for our food, the owner (as best we can tell she was the owner) was also sitting there having drinks and chatting with her friend while the rest of her staff were working like crazy and the chef was seemingly cooking one meal at a time. The beach next to the Casbah. Hopefully this post does not sound too bratty. We loved Mozambique and enjoyed its quirky and less than stellar attention to detail. We liked being off the beaten path in a place where tons of tourists aren't flocking. If we want to go somewhere where everything runs perfectly there are plenty of other places that we can visit. In our older age, Mr. Deep and I are getting a lot better about doing nothing for at least part of the time when we are on vacation. Our vacation M.O. used to be trying to cram as many activities, and usually physical activities at that, into our trips as possible all while laughing at and making disparaging comments about other holiday goers who were lying around all day by the pool and on the beach doing nothing. As illustration, we went on a trip to Tulum, Mexico a few years ago and were beyond proud of ourselves that we ventured outside of the all inclusive resort daily to do things like visit Chichen Itza, hike around other various ruins, rappel into caves to swim in cenotes and zip lining all while the rest of the guests at the resort did nothing but lie in the sun drinking, ordering food and maybe getting up periodically to visit the bathroom. When we drove out of the resort each day the guards were baffled asking us "where are you going" unable to imagine guests actually wanting to leave the resort. But that was then. Now we are a bit better and we do enjoy a half day or even a full day of sitting by the pool and doing nothing when we travel. And that's exactly what we did all day Sunday on our trip, until we had to venture out to eat. Gorgeous pool at the Dona Ana. We visited the Bar Nyeleti to have a few beers and get some lunch. The food we were anxious to try is called matapa. Matapa is a Mozambican specialty. It is a seafood stew that contains ground cassava leaves, ground cashews and of course seafood. It is served with rice. 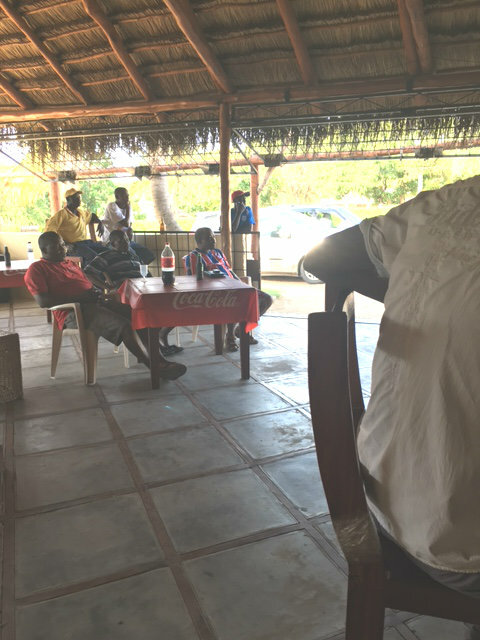 Unbeknownst to us, we arrived at the bar just in time to grab seats and order our matapa before the place filled up with locals wanting to watch Mozambique vs. Ghana in the World Cup soccer qualifier. Unlike a sports bar in the U.S. where there are many TVs and various sports being broadcast and everyone is eating and drinking, this was a more serious event with everyone moving their chairs to face the TV and no one bothering with any distractions such as food or drink. Most of those who were drinking were drinking Coke from 2 liter bottles and even seemed to have brought their own cups to the bar. Having a 2 liter Coke and intently watching the match. After eating our matapa (I loved it, Mr. Deep didn't) and watching some of the game, we ventured out into the street to walk around and see what else was going on in town. I should mention that it was Easter. We came upon a guy named Benny who was standing in the road when we walked by. He asked us if we knew how to play any musical instruments. We said no even though technically I know how to play the French horn. I decided not to share this tidbit because a) it's entirely not cool and b) I felt pretty confident that he wasn't standing out on a dirt road hoping a French horn player would stroll by. And I was right. When we followed him into a house party, there was a band there but no French horn. Yes, we followed him into a house party because sometimes you realize you are in a situation that could turn bad or even dangerous but more likely will be interesting and fun and we decided (by glancing at each other in agreement) that this would likely (and hopefully) be interesting and fun. Even though Benny was disappointed that neither of us played guitar, drums or could sing, that didn't stop him from asking Mr.Deep to join his band. So Mr. Deep air-played the keyboard for a while and that seemed to make Benny happy. Note the man in the white hat.